Alexandru Ioan Cuza (20 March 1820 - 15 May 1873), Freemason, was a Moldavian-born Romanian politician who ruled as the first Domnitor of the United Principalities of Wallachia and Moldavia between 1859 and 1866. Born in Barlad, Cuza belonged to the traditional boyar class in Moldavia, being the son of Ispravnic Ioan Cuza (who was also a landowner in Falciu County) and his wife Sultana (or Soltana), a member of the Cozadini family of Phanariote origins. Alexander received an urbane European education, becoming an officer in the Moldavian Army (rising to the rank of colonel). He married Elena Rosetti in 1844. In 1848, known as the year of European revolutions, Moldavia and Wallachia fell into revolt. The Moldavian unrest was quickly suppressed, but in Wallachia the revolutionaries took power and governed during the summer. Young Cuza played a prominent enough part to establish his liberal credentials during the Moldavian episode and to be shipped to Vienna as a prisoner, where he soon made his escape with British support. Returned during the rule of Prince Grigore Alexandru Ghica, he became Moldavia's minister of war in 1858, and represented Galati in the ad hoc Divan at Iasi, acting under the guarantee of the European Powers in the wake of the Crimean War to nominate a prince for Moldavia. Cuza was a prominent speaker in the debates and strongly advocated the union of Moldavia and Walachia. In default of a foreign prince, he was himself nominated in both countries by the pro-unionist Partida Nationala (profiting from an ambiguity in the text of the governing Treaty of Paris) and elected prince of Moldavia on 17 January 1859 (5 January Julian) and, after street pressure changed the vote in Bucharest, of Wallachia on 5 February 1859 (24 January Julian). Although he and his wife Elena Rosetti had no children, she raised as her own children his two sons by his mistress Elena Maria Catargiu-Obrenović: Alexandru Al. Ioan Cuza (born between 1862 and 1864-1889), and Dimitrie Cuza (1865-1888 suicide). Thus Cuza achieved a de facto union of the two principalites. The Powers backtracked, Napoleon III of the French Empire remaining supportive, while the Austrian ministry withheld approval of such a union at the Congress of Paris (18 October 1858); partly as a consequence, Cuza's authority was not recognized by his nominal suzerain, Abdülaziz, the Sultan of the Ottoman Empire, until 23 December 1861, (and, even then, the union was only accepted for the duration of Cuza's rule). The union was formally declared three years later, on 5 February 1862, (24 January Julian), the new country bearing the name of Romania, with Bucharest as its capital city. Cuza invested his diplomatic actions in gaining further concessions from the Powers: the sultan's assent to a single unified parliament and cabinet for Cuza's lifetime, in recognition of the complexity of the task. Thus, he was regarded as the political embodiment of a unified Romania. Assisted by his councilor Mihail Kogalniceanu, an intellectual leader of the 1848 revolution, Cuza initiated a series of reforms that contributed to the modernization of Romanian society and of state structures. His first measure addressed a need for increasing the land resources and revenues available to the state, by "secularizing" (confiscating) monastic assets (1863). Probably more than a quarter of Romania's farmland was controlled by untaxed Eastern Orthodox "Dedicated Monasteries", which supported Greek and other foreign monks in shrines such as Mount Athos and Jerusalem (a substantial drain on state revenues). Cuza got his parliament's backing to expropriate these lands. He offered compensation to the Greek Orthodox Church, but Sophronius III, the Patriarch of Constantinople, refused to negotiate; after several years, the Romanian government withdrew its offer and no compensation was ever paid. State revenues thereby increased without adding any domestic tax burden. The land reform, liberating peasants from the last corvées, freeing their movements and redistributing some land (1864), was less successful. In attempting to create a solid support base among the peasants, Cuza soon found himself in conflict with the group of Conservatives. A liberal bill granting peasants title to the land they worked was defeated. Then the Conservatives responded with a bill that ended all peasant dues and responsibilities, but gave landlords title to all the land. Cuza vetoed it, then held a plebiscite to alter the Paris Convention (the virtual constitution), in the manner of Napoleon III. His plan to establish universal manhood suffrage, together with the power of the Domnitor to rule by decree, passed by a vote of 682,621 to 1,307. He consequently governed the country under the provisions of Statutul dezvoltator al Conventiei de la Paris ("Statute expanding the Paris Convention"), an organic law adopted on July 15, 1864. With his new plenary powers, Cuza then promulgated the Agrarian Law of 1863. Peasants received title to the land they worked, while landlords retained ownership of one third. Where there was not enough land available to create workable farms under this formula, state lands (from the confiscated monasteries) would be used to give the landowners compensation. Despite the attempts by Lascar Catargiu's cabinet to force a transition in which some corvées were to be maintained, Cuza's reform marked the disappearance of the boyar class as a privileged group, and led to a channeling of energies into capitalism and industrialization; at the same time, however, land distributed was still below necessities, and the problem became stringent over the following decades - as peasants reduced to destitution sold off their land or found that it was insufficient for the needs of their growing families. Cuza's reforms also included the adoption of the Criminal Code and the Civil Code based on the Napoleonic code (1864), a Law on Education, establishing tuition-free, compulsory public education for primary schools (1864; the system, nonetheless, suffered from drastic shortages in allocated funds). He founded the University of Iasi (1860) and the University of Bucharest (1864), and helped develop of a modern, European-style Romanian Army, under a working relationship with France. 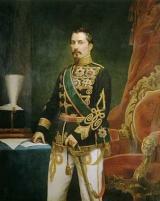 Cuza failed in his effort to create an alliance of prosperous peasants and a strong liberal prince, ruling as a benevolent authoritarian in the style of Napoleon III. Having to rely on a decreasing group of hand-picked bureaucrats, Cuza began facing a mounting opposition after his land reform bill, with liberal landowners voicing concerns over his ability to represent their interests. Along with financial distress, there was an awkward scandal that revolved around his mistress, Maria Catargiu-Obrenović, and popular discontent culminated in a coup d'état. Cuza was forced to abdicate by the so-called "Monstrous Coalition" of Conservatives and Liberals. At four o'clock on the morning of February 22, 1866, a group of military conspirators broke into the palace, and compelled the prince to sign his abdication. On the following day they conducted him safely across the frontier. His successor, Prince Karl of Hohenzollern-Sigmaringen, was proclaimed Domnitor as Carol I of Romania on 20 April 1866. The election of a foreign prince with ties to an important princely house, legitimizing Romanian independence (which Carol came to do after the Russo-Turkish War of 1877-1878), had been one of the liberal aims in the revolution of 1848. Despite the participation of Ion Bratianu and other future leaders of the Liberal Party in the overthrow of Cuza, he remained a hero to the radical and republican wing, who, as Francophiles, had an additional reason to oppose a Prussian monarch; anti-Carol riots in Bucharest during the Franco-Prussian War and the coup attempt known as the Republic of Ploiesti in August 1870, the conflict was eventually resolved by the compromise between Bratianu and Carol, with the arrival of a prolonged and influential Liberal cabinet. Cuza spent the remainder of his life in exile, chiefly in Paris, Vienna and Wiesbaden, accompanied by his wife, his mistress, and his two sons. He died in Heidelberg. His remains were buried in his residence in Ruginoasa, but were moved to the Trei Ierarhi Cathedral in Iasi after World War II.